All forms of energy healing share a connection in ways that are not always obvious. 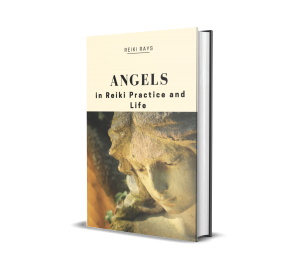 The energy of the angelic realm compliments the energy of Reiki. The angels are pure energy forms of love and light. They love connecting with Reiki healers. It usually happens that the angels come looking for us first rather than vice-versa. 1. As a child, were you fascinated with angels and fairies? If yes, it is a sign that the angels are part of your life. To quote my own example, no one in my family connected with the angels. Most didn’t even believe in them. But I always felt a deep fascination for them. When my sister and I role played as children, I often played the role of an angel. The word ‘angel’ sounded melodious to my ears! I also loved dressing up like an angel and singing angel songs. 2. You feel naturally connected with the angelic realm though you may not have all the information about it. You reach out to the angels in your own way. 3. You are inclined to learning about angel healing. 4. You feel a sense of peace when you hear someone talking about the angels, read about the angels or see angel pictures. 5. You often sense warm energy near you. This energy, which often signifies the presence of an angel, feels comforting to you. 6. You have dreams and third eye visions of angels. This is especially significant when you have these visions out of the blue rather than after you’ve read something related to the subject. 7. You feel a fascination for crystals and colours. The energy of every archangel is associated with the energy of a specific crystal. Feeling attracted to a crystal may signify that the corresponding archangel is trying to reach out to you. 8. You stumble upon feathers in unexpected locations. 9. After praying for help, you often witness the sudden appearance of birds, butterflies and certain animals. Seeing them gives you feelings of peace and reassurance. The angels often appear in different forms and bring us messages and healing. 10. People often use the word ‘angel’ to address you (especially when they don’t believe in angels themselves)! This is because people are able to pick up the energy of the angels in your energy field, even if they are not consciously aware of it. If you resonate with any of these, it is almost a certainty that the angels are part of your life, even if you were not conscious of it all these years. But now that you know the signs, trust that the angels are part of your life. You can start connecting with them right away. The more you connect, the stronger their presence becomes in your life and in your Reiki practice. For this, all you need to do is talk to the angels or write a letter to them. You can use the following lines as a reference and change the wording to suit your personal style. Thereafter, let go and allow the angels to work their magic in your life. Enjoy connecting with the Angels! Beautiful article as always by u..I am a level 2 Reiki Channel..please can u tell me which Angel/Archangel is related to Turquoise stone?& also how to know which is my guardian angel? Thank you so much..Please guide me how to connect to Archangel Sandalphon? I wear a Turquoise ring on a daily basis starting recently..please can you tell me how can i use it with my daily Reiki practice? Connie, I will write about this in another article sometime soon. I have a business I call Earth Angel as I was dubbed that name as I did random acts of kindness for various people I didn’t know. I started smelling flowery scents and determined that angels were letting me know they were with me, including in my car. I now experience others’ angels when I do reiki and perform it around their crown chakras. Nice article. Even while reading this article I started smelling heavenly fragrance. Thank u dear Angeles for being in my life. I had been wondering who the Arch Angel for the thymus chakra is. I had thought it might be Sandalphon. The colour of this chakra is turquoise. Thank you for confirmation! One of my friend told me she notice by some people that they saw a orange ball in her shoulder than later she herself saw that ball (in darl blue color) again and start to speak with it, he told her go ahead you have enough power to improve in your life …. is he an arc-angle ? Thank you Angel haripriya thank you very vru much. Ya . I do connect with signs u told. Out of 10 signs 7 matches with me. Nice article by u as always. Its amazing and nice one. I too feel that the angels are around. Many signs I feel. Thank you for the wonderful words! Great article! An eye opener! Previous post: Can the Flow of Reiki Be Restricted?